Modernize the financial close. Streamline internal and external reports to deliver faster, more accurate financial statements with connected data. Replace manual financial close processes, and eliminate the security risk of uncontrolled desktop spreadsheets in your financial reporting. Have confidence in your final numbers with version control and a comprehensive audit trail that starts at the data source. Unify financial data with nonfinancial data, such as operational metrics, in a controlled cloud environment for more comprehensive reporting. Pre-configured connectors enable the import of data from multiple accounting and financial systems into Workiva solutions. Connect structured data from traditional sources like ERP systems or general ledgers, as well as unstructured data from spreadsheets, documents, and emails. Create consistency for your reporting outputs. Automate data collection from departmental stakeholders during the close cycle with flexible templates. Normalize your data from different areas of the business, without having to worry about reformatting. Templates can be used for both unstructured and structured data, making real-time updates and roll forward to the next report easy. Turn your collected data and commentary into complex financial reports. Connect data from the accounting close to financial statements, board reports, and executive presentations. With connected data and analysis, you can quickly build a consistent, cohesive story to present to management, investors, stakeholders, and the board. Eliminate tedious, time-consuming tasks of collecting data from the period end close for financial forecasting and reporting. Rely on a repeatable framework that can easily be rolled forward, creating time for more financial planning and analysis (FP&A). Shorten the time to insight, and play a larger role in business decisions. If the source changes, every linked instance updates at the same time. Reduce the risk of errors, and track every change with a full audit trail. Use blacklines to compare versions. Collaborate across teams to draft financial, management, and board reports in the cloud—in real time, with no version control issues. Connect contributors across the broader finance function, such as FP&A or tax, to create a holistic reporting environment for monthly, quarterly, and yearly financial reporting. Control access and increase transparency to the reporting process to reduce errors and increase efficiency. Workiva enables you to manage the collecting and collating of narratives, sourcing data, controlling structure and format, and managing multiple cycles of edits and approvals, all within a single, secure, and easy-to-use cloud platform. Work with your teams in the same document, at the same time. Role-based permissions enable report owners to control who can access, view, and edit data and text. Communicate within the platform to track feedback, reduce back-and-forth during editing, and shorten turnaround times. Create presentation-ready financial reports for business leaders, investors, and the board of directors. Streamline the review process and provide visibility into changes, comments, and feedback securely within the Workiva platform. 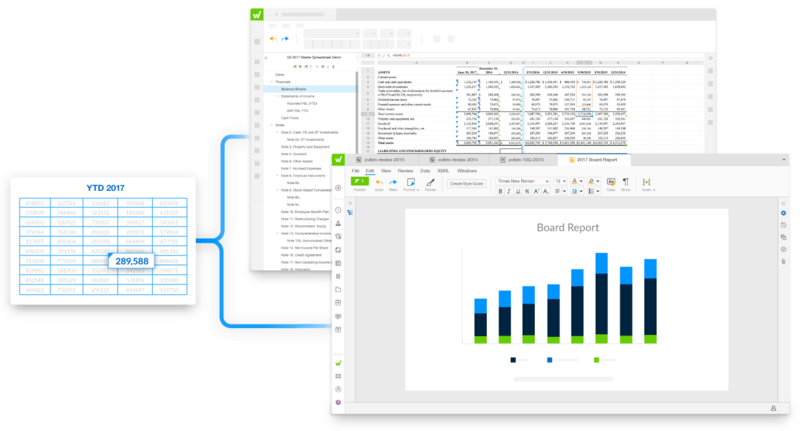 Easily create high-quality financial reports, board books, and presentations in the format that works best for your team—in spreadsheet, document, dashboard, or slide form. Leverage mobile apps for report review and commenting. Manage reviews, approvals, and final sign-offs all on the same document. Deliver robust financial reports filled with dynamic charts, tables, and source data linked from multiple enterprise systems and spreadsheets. Workiva enables you to unify and prepare data with queries, contextual tagging, and filters. Attach supporting documentation to specific values in your quarterly and annual reports and other financial disclosures, or request documentation from colleagues. Annotate and tie out financial statements and workpapers. Collect, manage, disclose, report, and analyze tax data and related documents. I’m very excited about our new Workiva reporting solution. The control that it affords us over our process from end-to-end has brought significant time-savings to our process and has allowed us to use our resources in other capacities. The board reporting solution looks exactly like the manual book that our board gets. It’s tabbed, and you find everything just as you would in a hard copy package.